Courtesy of New York Times: Sgt. Jesse E. Leach of the Marines assisted Lance Cpl. Juan Valdez-Castillo, who was shot by a sniper in the town of Karma. He survived. The insurgents in Iraq for some time had relied on stand-off weapons to do their warfare (i.e., IEDs). With the influx of the more well-trained al-Qaeda fighters across the Syrian and Jordanian borders, these tactics have given way to guerrilla tactics. Every stand-up battle in which the insurgents engage the U.S. troops involves a loss for the insurgents, sometimes significant. It has taken time for the evolution to occur, but the change to asymmetric warfare seems to be about complete. On June 21, 2006, Marine Lance Cpl. Nicholas Whyte died from sniper fire in the streets of Ramadi. On September 26, 2006, Marine PFC Christopher T. Riviere died in the Anbar Province from sniper fire while wearing full body armor. On October 8, 2006, Marine Captain Robert Secher died from sniper fire. On October 22, 2006, Specialists Nathaniel Aguirre and Matthew Creed, US Army, died from sniper fire while on foot patrol in Baghdad (see also a North County Times article on Creed). There is no shortage of personal stories on fatalities from sniper fire, but stepping back from the personal to the statistical, there is no question that sniper attacks have increased in both frequency and lethality. Sniper attacks on U.S. troops have risen dramatically as more Americans have been pulled into the capital to patrol on foot and in lightly armored vehicles amid raging religious violence. Sniper attacks, generally defined as one or two well-aimed shots from a distance, have totaled 36 so far this month in Baghdad, according to U.S. military statistics. That’s up from 23 such attacks in September and 11 in January. The figures were confirmed by Lt. Gen. Peter Chiarelli, the No. 2 commander of U.S. forces in Iraq. “The total numbers are elevated, and the effectiveness has been greater,” he said. At least eight of the 36 sniper attacks in Baghdad in October have been fatal, according to accounts by hometown newspapers reporting on the deaths of individual soldiers and Marines. Snipers have also killed four U.S. servicemembers in Anbar province this month. 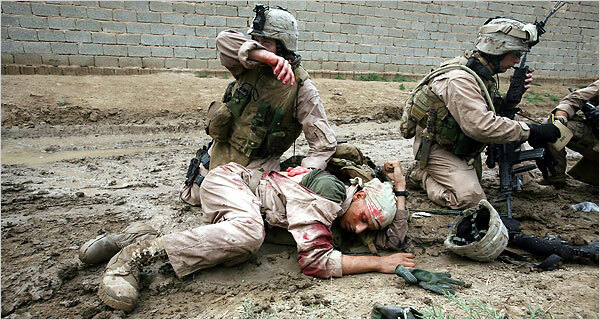 The picture above visually conveys the story of the sniper attack that wounded Lance Cpl. Juan Valdez-Castillo. The bullet passed through Lance Cpl. Juan Valdez-Castillo as his Marine patrol moved down a muddy urban lane. It was a single shot. The lance corporal fell against a wall, tried to stand and fell again. His squad leader, Sgt. Jesse E. Leach, faced where the shot had come from, raised his rifle and grenade launcher and quickly stepped between the sniper and the bloodied marine. He walked backward, scanning, ready to fire. Shielding the marine with his own thick body, he grabbed the corporal by a strap and dragged him across a muddy road to a line of tall reeds, where they were concealed. He put down his weapon, shouted orders and cut open the lance corporal’s uniform, exposing a bubbling wound. Lance Corporal Valdez-Castillo, shot through the right arm and torso, was saved. But the patrol was temporarily stuck. The marines were engaged in the task of calling for a casualty evacuation while staring down their barrels at dozens of windows that faced them, as if waiting for a ghost’s next move. This sequence on Tuesday here in Anbar Province captured in a matter of seconds an expanding threat in the war in Iraq. In recent months, military officers and enlisted marines say, the insurgents have been using snipers more frequently and with greater effect, disrupting the military’s operations and fueling a climate of frustration and quiet rage. I have covered the weaknesses in the Interceptor body armor system with its gaps in protection along the lateral torso. The insurgent snipers have become quite sophisticated in their tactics. They have become disciplined shots, as this chilling quote by elements of the Second Battalion, Eighth Marines indicates: “Most of the time, the marines said, the snipers aim for their heads, necks and armpits, displaying knowledge of gaps in their protective gear. From my point of view, create Marine and Army Guerrilla teams. We have this in the form Recon Marines, and possbily Rangers for the Army. However, the military should create teams exactly for guerrilla combat. The Marine Raider teams from WWII could also be brought back to fight the insurgents and snipers at their own game. In addition, special forces, and seals could be used. There are many options available, and the military just needs to pick one. The total destruction of any neighborhood that allows an enemy sniper to operate should commence after the first shot is taken. We had quiet a problem with snipers where I was deployed. And I’m talking about snipers, not small arms fire. From about 15 minutes on in a neighborhood, we could be expected to be sniped. A few times it was down to 5 minutes in a neighborhood before well placed shots. As far as we figured, we were either followed in cars (this was a big city in Iraq) or the neighbors would call up as soon as we started a dismounted patrol. My feeling is that to catch a sniper, you need a company sized element with aerial support on stanby. One patrol element goes into a neighborhood to bait the sniper, while the other elements are a few, maybe 2-3 minutes away, perhaps concealed, ready to lock down the neighborhood and then sweep through it, looking for weapons and doing the hand wipe tests on all males. However, this is incredibly man power intensive and we just don’t have the numbers. Guerilla tactics: This requires support or acquiecense from the population, which we don’t have. Someone will dime those teams out, or spot them, as it’s very difficult to emplace for any time in a neighborhood (even at night). People just figure out where you are, not always, but enough time. So then two things happen: the snipers/IED emplacers move to where you are not, or they wait for those emplaced elements to move out and hit you. Also, you again draw a lot of combat power for the QRF. Now if you let the teams go without contact and move at will, they’re going to get ambushed and killed. And a whole team killed or captured like that, well, it’s not good. Also, those electronic find the shooter gizmos aren’t very good. Schedules are changed, but there are only so many exits out of a FOB, so they can track you. And finding spotters is so difficult because all they may have is a cell phone and then you can never be sure and you have nothing to hold them for. Bottom line: We need more troops but of course have nowhere to get them from. Everything we need to do is very manpower intensive. I don’t like to leave anonymous comments. I would rather have a name and valid e-mail address. I never divulge this information. Regarding what you are saying, it seems doubtful that ALL of the snipers are shooting API (for the readers, this is armor piercing incendiary) rounds, since the article at the NYT makes no sense in that case. Why would the snipers spoken of by the Marines in the article be aiming for the gaps in body armor if they all had been shooting API that could go through Humvee doors? At any rate, I do not doubt the viability of the suggestion you make in the first paragraph, but concerning manpower, there are plenty of places to get the troops from. U.S. policy has to recognize the need and make the changes. Take the troops from Europe, and from Japan. Let Japan defend itself and it will rearm. Europe is not in danger and we have no business spending the capital to defend those countries. Sorry for the anon comments, but I’m active duty (grunt), have only my AKO email and am going back to iraq in a couple of months, so with all this bull about chain of command looking at what you publish online and DoD reading websites looking for military postings, I’d rather not. As for API, I didn’t mean all use it. In our area, this may was when we started seeing them. Those SAPI plates were mixed successes against the rounds, depending on the angle and speed of the round. As for going through Humvee doors, sorry, I meant penetrate them, I’ve seen at least 1/2″ penetration, and one stopped by the last kevlar layer in the doors. I did see a round cut clean through a humvee turret though. Why the Marines don’t have the rounds used against them I don’t know. Maybe they’re not widely available or more expensive, or maybe they’re shooting at a closer distance than they did with as (as a rule, 250-350 meters), so they can aim more precisely. We had a lot of head level shots. And by troops, of course we technically have the numbers, but I meant that at this point, the kind of re-organization neccessary to get them into the fight just isn’t going to happen. Snipers are bad news, to be sure. 1/506th in Camp Corregidor, Ramadi lost two journalists to snipers (wounded, not dead), which is all the more startling considering how few journalists go to Ramadi much less any given FOB like Corregidor. My physical training for my last trip comprised primarily running in full body armor, because armor and speed are your best protection against snipers. All that said, consider this: True guerrillas need some sort of support from the people, even if it’s gained through fear rather than similar ideology or family relations or whatever. The sniper needs only a decent rifle and his own abilities. The perceived need for an increase in snipers could well represent a concession that the guerrillas are having increased difficulties. I have an upcoming article on Ramadi that indicates that at least in that city, this is indeed the case. Military officials often say the insurgents in Iraq are a “learning enemy” — able to adapt to tactics and defenses used by U.S. and allied troops. As defenses against improvised explosive devices improve, insurgents are turning to sniper attacks. One technique they apparently learned from the United States is the method used by murderers John Allen Muhammad and Lee Boyd Malvo, who terrorized the Washington, D.C., area in 2002. Muhammad and Malvo killed 10 persons and wounded several others by firing rifle shots through a hole in the trunk of their 1990 Chevrolet Caprice. Now the insurgents in Baghdad are using the same technique. Military officials recently discovered 40 vehicles modified for sniper attacks. The vehicles had holes drilled through the sockets for two taillight bulbs. “One hole was for the scope and one was for the barrel,” a defense official tells us, who noted that they appear to have picked up the technique from the D.C. snipers. Why send More people to the slaughter, Retrain the snipers in extensive Counter-Sniper Techniques, and let the snipers take them out. After all the Most effective way to get a sniper, is with another. that or u just bomb the whole city…. Using API is not all that important when most of the shots are taking place under 200M and they are aiming for the exposed parts of the body. I’m a “school trained” sniper and I’ve reviewed all of the insurgent sniper videos I can find on the internet and all the successful ones are aiming for the neck, face and exposed head or for the sides and armpit. Why would the snipers spoken of by the Marines in the article be aiming for the gaps in body armor if they all had been shooting API that could go through Humvee doors? I’d never shoot at a vehicle… just the people. The shooter waits for the people to get out in the open, shoot one, and then displace to another position or lay low until the targets think you are gone then fire again. The posters suggestion is a good one but I’ve been in the miltiary for over 16 years and he is right. We are short handed and running on a thin margin with little true and sustainable “reserve”. I know of no signifigant #’s of troops in Japan or Europe that we could pull. Most troops that are in europe are deploying as much and often as the stateside troops. And as far as japan.. what are you talking about? Do you mean Korea? We have #’s of troops in korea but not Japan. I think we should reduce our committment there. My feeling is that to catch a sniper, you need a company sized element with aerial support on stanby. One patrol element goes into a neighborhood to bait the sniper, while the other elements are a few, maybe 2-3 minutes away, perhaps concealed, ready to lock down the neighborhood and then sweep through it, looking for weapons and doing the hand wipe tests on all males. Good idea – workable and what a sniper would fear. Lock ’em down and sweep the area. Check every MAM for gunshot residue that we come across. However, this is incredibly man power intensive and we just don’t have the numbers. Unfortunately this administration didnt have the brains, foresight or balls to push for an increase of the Army and Marines back right after 9/11 like they should have when they still had the support of the Congress and the US voters. U.S. policy has to recognize the need and make the changes. It’s not the policy so much as this administration. Their is as new COIN manual out. This damn thing should have been worked on back in the spring of 2002. The “leaders” need to start paying attention… this is a neck deep COIN war. And whether we want to admit it or not, it is. Europe is not in danger and we have no business spending the capital to defend those countries. We are not defending them, we are continuing to use the bases we paid huge sums of money to build and maintain as forward staging areas which are useful. You apparently do not grasp how huge the log train is for OEF and OIF, especially the airlift aspect. Aircraft, C17s and C5s and such coming out of Dover and other points CONUS fly over to Europe (UK and Germany) and stop to refuel, repair, change crews, upload/download cargo and such… if we didn’t have those places it’d be incredibly difficult to get all the supplies and troops to theater. When we lost K2 in ’05 it made keeping the boys in Afghanistan much, much harder (but not impossible) to keep supplied. Their is a new COIN manual out – check it out – its far past due. I would like to get a valid e-mail address from you. The one you left is bouncing. There have been conferences held by the services to disseminate successful tactics. The Marine Corps had one recently. 3/5’s sniper platoon had a very successful tour this year, and those lessons learned are being distributed to other battalions. The sniper threat can never be completely eliminated, but the military is working to reduce it. However, I think we are going the wrong direction with body armor. The focus needs to on developing and disseminating tactical solutions. After reviewing other suggestions about how to curtail enemy sniper success, Ive come to the conclusion that a major cause is the prohibition of indirect fire support in urban settings. If we were allowed to lob more 81’s 60’s and howitzers into suspected sniper hides I bet wed take out some spotters and snipers and would demoralize the ones that escape the bombardment of mortars and artillary. Another suggestion would be to make it mandatory to board up all upper level windows like crack houses in areas commonly patrolled by US troops. You are currently reading "Snipers Having Tragic Success Against U.S. Troops", entry #372 on The Captain's Journal. This article is filed under the category(s) Iraq,Small Wars,Snipers,Weapons and Tactics and was published November 9th, 2006 by Herschel Smith.